It’s like now Siri is also turning against Apple. Apple bought Siri to market their phone iPhone4S. 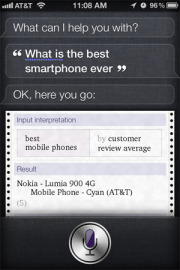 And you will get Siri after buying iPhone4S for more than 800$. Isn’t that funny. However there are still many alternatives avaliable for android out there and for free. We are not fools to buy a phone for a software. Now Siri is also talking against apple.